I did wonder about the ‘crumbled and blew away’ part of that prophecy. It seemed too specific… but, of course, we’ve all lost bets on interpreting prophecy. Nice summation and good theory! So you’re saying that Alys rode straight to Castle Black from Karhold, right? If true, however, this means that the vision Mel had of the girl riding beside a lake hasn’t happened yet. 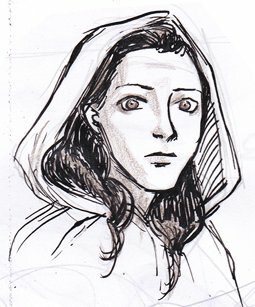 How could Jeyne end up alone riding north along the east side of Long Lake? Or are there more Mel errors there? I would like to see how this could be extended to cover there implications! Yes, I think it definitely could be some kind of misinterpretation by Mel, although I could also see any number of ways that George could have Jeyne become separated from her group and end up trying to reach the Wall on her own, possibly with pursuers behind her (“When she can she rides along the bed of little streams, to throw hunters off her trail.”) I’d also point out that “Long Lake” was Mance’s interpretation. Mel described it as “…water. Deep and blue and still, with a thin coat of ice just forming on it. It seemed to go on and on forever.” Why not the Bay of Ice on the western shore, and Jeyne following the shore to get to the Shadow Tower? Basically I don’t see what is essentially an in story interpretation of a vision being a hindrance to the theory, since we know Mel’s errors are usually of interpretation, and Mance is relying solely on her description to reach his conclusions. Interesting….however I believe Melisandre has already had another vision of Arya that she again misinterpreted. She seems to have a knack for allowing her biases and preconceptions to cloud her visions. She asks for a vision of the servant(s) of the Great Other and what she sees is a boy with a wolfs head….we instantly think of Bran who has warged into Summer on numerous occasions….but Arya has been having dreams of being a wolf hunting in the woods of Westeros….these are not dreams, she is subconsciously warging into Nymeria. More evidence: The Faceless Men serve the Many Faced God who is represented as all the death gods of the world as one….including the Lion of Night, a god from Yi Ti who appears to be a clear analogue to the Great Other as well as one of the two aspects of R’hllor, the Lord of Light…and Shadow. The other aspect is the Maiden Made of Light, another Yi-Tish goddess. So the Faceless Men may then actually been in the service (or thralldom) of the Great Other, whatever he/she/it really is. Meaning that Arya could then also be a servant of darkness. So perhaps Melisandre actually was seeing Arya and mistaking her for a boy? T’would not be the first time that mistake was made lol. Hi there and thanks for commenting! While most of what you’re saying is quite accurate, I think that as far as Mel’s vision of the “Great Other” goes it’s important to remember that SHE isn’t the one interpreting the boy as Bran- the reader is. So we can’t apply Mel’s well known confirmation bias to this situation. The reason most of us *assume* she’s seeing Bran is because in her vision the boy is noted as being **beside** the figure Mel thinks is the Great Other, but who’s quite clearly Bloodraven: “A wooden face, corpse white. Was this the enemy? A thousand red eyes floated in the rising flames. He sees me. Beside him, a boy with a wolf’s face threw back his head and howled.” Since Bran has no less association with wolves than his sister, Occam’s Razor dictates that Bloodraven and Bran is most likely the correct interpretation for the reader to make.